Alexander Boynton Jr. is a Canadian bassist, composer and producer, who has his spiritual roots in the Gospel music. Inspired by Hugh Masekela, Les McCain or Roy Ayers he finally found his stage in the smooth jazz music. For his debut album Doo Bee Doo Bop (2010) Alexander invited top-notch musicians of the smooth jazz scene like Jeff Lorber (keyboards), Tony Maiden (guitar), Tony Moore (drums), Rick Braun (trumpet), Paul Jackson, Jr. (guitar), Lenny Castro (percussion), Phil Perry and Chelsea Nicole (vocals), and many more. Jeff Lorber produced, engineered and mixed the complete album. With Beyond The Gate Alexander Boynton swears us to his fantastic world of music. Miguelito Valdez mesmerizes with his muted trumpet, while Jeff Lorber sets his statement on piano. The Latin jazz flavor is delivered by percussion legend Lenny Castro. A mysterious piece in the style of Eric Burden's War. Kate, written as an ode to strong single mothers emerges from his cocoon into a fiery slam jam with Jeff Lorber on the organ. The amalgamation of flute, muted trumpet and flugelhorn on So Long Ago is a reminiscence of Isaac Hayes' music (Shaft, The Ghetto). Alexander on bass is in best accompany by famous trumpet player Rick Braun. Real Live Woman presents the vocal dream duo Phil Perry and Chelsea Nicole in a highly sultry song with a wonderful guitar line. When a prolific guitarist like Jeff Golub meets Jeff Lorber like on Frisky Boogaloo we experience Lorber not only on his known keyboards but also on rhythm guitar. Alexander Boynton adds a brilliant bass flow. Doo Bee Doo Bop presents Alexander's quality as melody maker. The piccolo bass is the perfect instrument to transfer song notes into the bass section. What would happen, when Paul Jackson would be in the role of George Benson. The Latin flavored Soul Sista gives you the answer. Magnificent! Movie Bass Song features David Mann on flute as lead instrument in a very intimate song. David recently finished the project Finding My Way Home in support of his brother Ned's fight against ALS. Tony! Toni! Toné! 's It Never Rains In Southern California from their album Revival (1990) is superbly interpreted by the guitar alliance of Paul Jackson Jr., Tony Maiden and Alexander Boynton Jr. This is melodic guitar sound at its best. The Payolas' Eyes Of A Stranger is a catchy song presenting vocal wonder Chelsea Nicole in splendid condition. But a singer can only shine with such an accompaniment of professional musicians like Boynton, former member of The Payolas, Michael Thompson on guitars and keyboard wizard Jeff Lorber. The song Lots Of Money is fostering in the Funk/R&B realm. But mainly lives by Boynton's short bass explosion. The album closes with a longer version of It Never Rains In Southern California exposing Jeff Lorber and Rick Braun in distinctive solos. 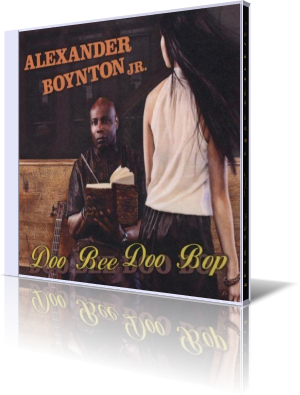 Alexander Boynton's debut album Doo Bee Doo Bop is highly recommendable. 6 stars on a five star rating scale.